I never used to be a big mustard fan. I grew up with mild and hot English mustard like all good English children should, but other than that mustard was just another "sauce". Only in the last few years did I even have Amercian mustard on hot dogs, and even then it was only because Mr Steph likes it. One day I bought Dijon mustard for a herb crusted lamb recipe I found. It was very delicious (which reminds me I should make it again! ), but after I didn't really know what else to use it on. I started experimenting, using it in my potato salad instead of mild English mustard and also on sandwiches, then one day I decided to try it on some crumbed chicken I was making. "Mustard chicken", as it is commonly called at our house now, is a regular mid-week meal, especially in summer as you can enjoy it with a big salad or even veggies. Sometimes we are a bit naughty and have it simply with baked chips like in the photo above. No matter how you have it, I can assure you that you will not just make it the once and think 'Meh, I guess that was ok ...' It really is delicious. I made this just over Christmas for my visiting family and they loved it too, so it's not just me and Mr Steph approved! 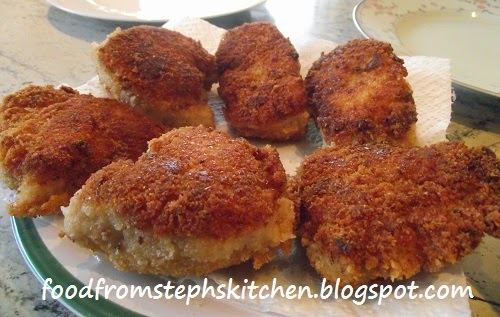 You can bake the crumbed chicken, but we usually shallow fry them as they go that little bit more crispy. By double crumbing the chicken (which I'll explain later if you are not sure what that means) also gives you more of a crispy, thicker crumb on the chicken. Firstly measure out your bread crumbs and milk in two separate bowls. Also measure our your mustard and set it aside. Now onto the chicken. Cut your chicken breasts in half as evenly as you can. Of course you will have the fatter ends that will be thicker but that's ok. You can simply flatten them with a meat mallet quickly, but often I just let them cook a little longer later on. Once halved, cut each piece of chicken into two or three pieces. We usually cut it into three so that you have smaller, crispier pieces. You could even leave them as large pieces of chicken (with the whole half of the breast). It's entirely up to you and what you would like. Arrange the chicken side by side on your cutting board and spread the Dijon mustard generously over one side of the chicken. 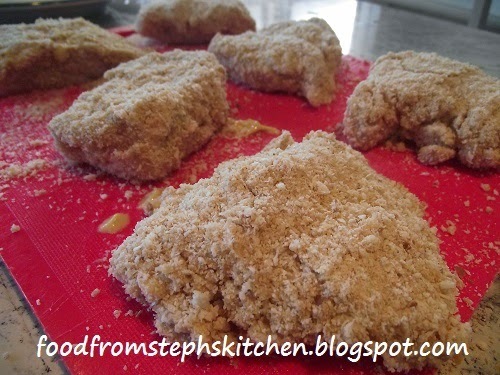 Now coat the chicken pieces one by one in the bread crumbs, setting them back on the board once completely covered. As you are crumbing the chicken on the mustard side, gently push the bread crumbs into the mustard so that they stick. One by one dip the chicken carefully into the milk, and then back into the crumbs again. This is double crumbing, which gives your chicken that extra layer of crumbs. Once cooked this will make it extra crispy and give it this nice crunch of a crumb layer. Traditionally when you double crumb something you would dip it first in the milk (or an egg and milk mixture), then the crumbs, and then you repeat this again. As Mr Steph is slightly allergic to eggs I try to avoid cooking with them if I don't need to. In this recipe I am missing that first dip in the milk as you want to keep as much of the mustard on the chicken as possible. You can use this technique to crumb any sort of meat, such as steak (for crumbed steak or schnitzel), fish or even pork chops. I find that double crumbing it really gives it that proper fully-coated layer that you want. In a large pan or electric pan add enough vegetable or rice oil (I use rice oil) to give around 1 cm in the bottom of the pan. Heat up your oil until you can wave your hand over the top and it feels warm. Turn down the heat to medium and add the chicken into the oil with tongs so that you don't accidentally get your fingers in the oil (which I have done far too many times!). The reason you want it to be on a medium heat and not too high is you don't want your crumbed coating to burn but the chicken not be cooked properly. Cook the chicken until you can see around 1/2 cm of the edge of the chicken a different colour to the middle of the chicken, then turn over. I find this is the best judge of when you know it's safe to turn your chicken. This way you are not having to cut open your chicken to check if it's cooked and flipping the chicken a million times in the oil. The less you turn the chicken the more crispy it will be in the end. Once your chicken is a golden brown on the other side remove the chicken to a plate with paper towel. This will soak up the oil before you put it on the plate - otherwise you'll be serving oily chicken! 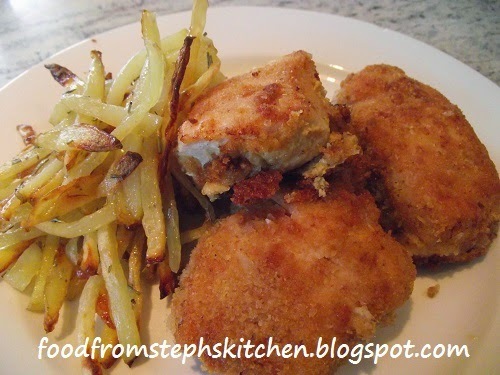 Serve with salad and chips, or mashed potato and veggies. 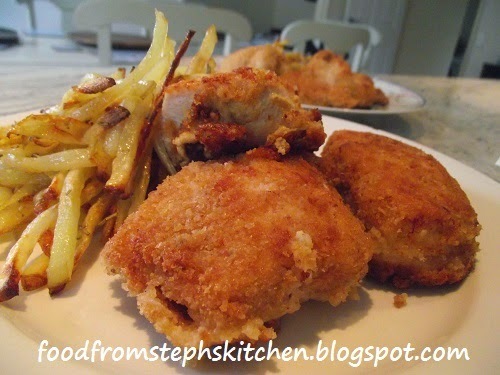 Now you can deep fry or bake this recipe, but I prefer to shallow fry as it still gives you that crispy outside without me having to feel guilty about it sitting in all that oil! If you are baking simply back it in a moderate open for around 25-30 mins or until golden brown. Simply poke the chicken with a small knife or skewer and check that any juice that escapes is clear before serving. * Use rice milk to make this recipe dairy free.